Is Climate Change Destroying the World Economy? (Nature Letters; PDF at web.stanford.edu). "[U]nmitigated warming is expected to reshape the global economy by reducing average global incomes roughly 23% by 2100 and widening global income inequality." 62% of Americans have less than $1,000 in savings and 21% don’t even have a savings account (marketwatch.com). About a quarter of Americans have negative net worth. 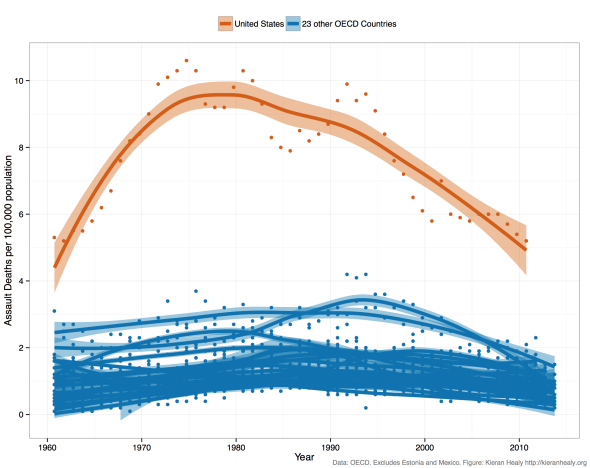 Assault deaths per 100,000 population for the U.S. (orange) versus other developed countries (blue). The U.S. is a violent place (wonkwire.com). "The good news is that the U.S. rate [of death by assault] has steadily declined since 1980. The bad news is that we’re still about three times as violent as any other country in the dataset." Study shows lottery is multimillion-dollar tax on the poor (bangordailynews.com). What did you think it was? Analysis: Donald Trump talks to voters at a fourth-grade level (onpolitics.usatoday.com). This is based on Flesch-Kincaid readability analysis of a relatively small number of speeches, hence not terribly reliable, but probably close enough. The U.S. Navy's Sitting Ducks (bloombergview.com). Important. The Navy's own war games and simulations show America's aircraft carriers to be a point of vulnerability, not strength. Kansas is now earthquake country (occupydemocrats.com). Northern Oklahoma and southern Kansas are now home to 17% of all 2.5-magnitude-or-higher earthquakes in the world. Are thermostats making us sicker? (treehugger.com). "Scientists know that our body has evolved to respond to cooler weather by altering the production of proteins that help us fend off things like the flu, but when we keep our thermostats fixed to warm temperatures, our bodies get fooled into thinking it's still summer, leaving our immune systems more vulnerable." For the real story, skip right to the actual study in the Proceedings of the Royal Society. Commodity Traders Helped Spark the War in Syria, Complex Systems Theorists Say (motherboard.vice.com). Unfortunately, the actual paper is paywalled. What caught my eye is that the authors of the study linked food-price increases with ethanol conversion, arguing that fuel ethanol programs should be abandoned since they are neither environmentally friendly nor energetically advantageous. In a world of cheap oil (and starving people), converting corn to ethanol makes little sense; basically yet another corporate welfare scheme. Scientists Hope to Lengthen Dog Years (technologyreview.com). Interesting story about trials of rapamycin (in dogs) as an anti-aging drug. Highlights our current state of ignorance about aging. 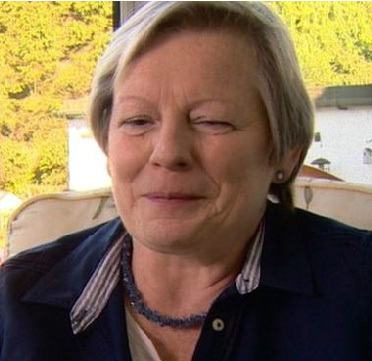 The woman who can smell Parkinson's disease (bbc.com). Perth resident Joy Milne successfully sniffs out Parkinson's 11 times out of 12. Autoimmune Diseases and Severe Infections Are Risk Factors for Mood Disorders (JAMA). From 2013. "Any history of hospitalization for infection increased the risk of later mood disorders by 62%." 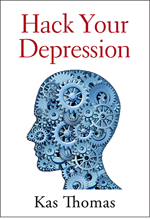 Based on a study of 3.5 million people, 91,637 of whom had hospital contacts for mood disorders. Antidepressant Studies Found Tainted by Pharma Company Influence (scientificamerican.com). "Meta-analyses by industry employees were 22 times less likely to have negative statements about a drug than those run by unaffiliated researchers. The rate of bias in the results is similar to a 2006 study examining industry impact on clinical trials of psychiatric medications, which found that industry-sponsored trials reported favorable outcomes 78% of the time, compared with 48% in independently funded trials." Alabama Congressman vows to impeach Hillary on her first day in office (www.al.com). Millennials warming to Sanders, cooling to Clinton (politico.com). Baby rescued alive hours after migrant boat sinks in Aegean Sea (euronews.com). Wearing a life jacket. But still. How can you read about this and not want to cry? Who will fight the next war? (economist.com). No one? Let's not kid ourselves. The socioeconomically disadvantaged will fight the next one. And the next one. And the next. Special Request for Info: Have you tried (or has anyone you know tried) cariprazine for bipolar or schizophrenia? My wife and I would like to know your experiencce. Write to us: authorzone@hushmail.com. TIA. Hungry for more? Try last week's Friday Water Cooler! To Vape, or not to Vape?